"I've got a great idea that will save tons of time and really help people be more productive"
Introducing a new product idea really starts with the question: "How big is your market?" If the market isn't big enough to support production then it doesn't make sense to proceed on the current idea but perhaps to modify it for a larger market. According to AcuPoll, a research agency out of Cincinnati, as many as 95% of new products introduced each year fail. McKinsey & Company conducted a study to better understand what sets those who are successful apart. The results seem simple: "Top performers were twice as likely as bottom performers to research what, exactly, customers wanted." If your new widget is a great solution for people who make dental drills, could it be slightly modified to be used to make a all types of drills? Beyond the product questions there are many other considerations that you need to ponder as you contemplate launching a new product. ​Many people fail to realize the time an costs associated with bringing a product to market the first time. Below are a list of questions that we typically start asking when meeting a new client. Logo - What is your brand's Logo? Do you have a complete identity set of logo's for use on the website, print, social media, stitching for shirts and clothing? Do you have square and horizontal versions? Terms & Conditions - Have you developed terms and conditions for the sale of your product? FOB points, Ordering errors, re-stocking fees, inventory exchanges, should all be thought through so that you are covering your costs down the road. Marketing - Do you have a website? Have you developed copy and content describing your products features? What about literature? Have you created it? Do you have good artwork and pictures? Do you have drawings explaining what the product does? Launch Strategy - Will you have a structured roll-out using agents and limited distributors or will you first sell direct and private label? 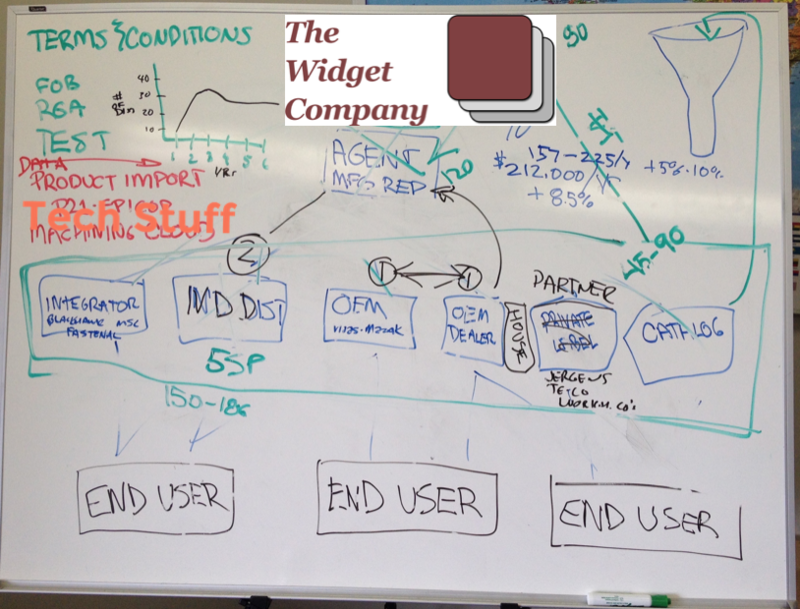 What is the short term and long tern sales strategy? Cash Flow - Will you have the cash flow to support the purchase of raw materials and the support of the sales efforts with literature, promotional items, trade shows, advertising and then be prepared to wait 45 - 60 days for payment after a sale? Below are some cost estimates for services that you may may need to utilize in developing your brand's launch. These do not include our consulting fees which can range from $2500 - $10,000 month. Literature Development - $1,500 - $10,000 - Just like your website this is really going to vary based upon copy and content you have already developed. If you build the website first you can often reduce your literature costs by utilizing much of the same content form the web. Trade Show Booth - Costs of booths range from $2500 - $10,000 depending on the booth size. If you would like flooring or custom graphics you may need to pay for additional design time. Remember to add in shipping and trade show booth space that can add another $1000 - $5000 or more per show once you include travel, food and lodging. At Rapid Production Marketing we guide you through the questions you are going to face early on in the process. We help you to anticipate hurdles you are likely to encounter as you launch your brand and bring to your attention the ramification of decisions that you make today on your long term sales goals and objectives. We help you choose the road that best suits your short term and long term needs to grow your company and your sales. Call us today at 412.996.5700 to set up an initial brand meeting. Typically this only costs $750 for a full day plus travel expenses. At the end of the day you will have the rudiments of a brand launch strategy. The technology adoption lifecycle is a sociological model that describes the adoption or acceptance of a new product or innovation, according to the demographic characteristics of defined adopter groups. The process of adoption over time is typically illustrated as a classical normal distribution or "bell curve". The model indicates that the first group of people to use a new product is called "innovators," followed by "early adopters". Next come the early majority and late majority, and the last group to eventually adopt a product are called "laggards". 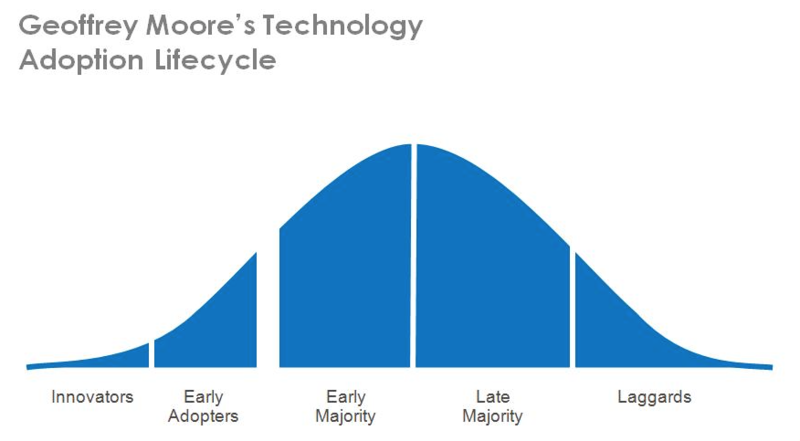 In his book Crossing the Chasm, Geoffrey A. Moore begins with the technology adoption lifecycle model, but argues there is a chasm between the early adopters of the product (the technology enthusiasts and visionaries) and the early majority (the pragmatists). ​Moore believes visionaries and pragmatists have very different expectations, and he attempts to explore those differences and suggest techniques to successfully cross the "chasm," including choosing a target market, understanding the whole product concept, positioning the product, building a marketing strategy, and choosing the most appropriate distribution channel and pricing.